World-beating design let down by bugs? Review Nokia's eagerly-anticipated E70 phone revives one of the company's cleverest designs, stuffs it full of bleeding-edge features, and aims it squarely at the enterprise market for the first time. It's one of the most versatile designs on offer, and appears at a time when enterprise email has matured. Unfortunately, the promise of the design remains just that. The phone has been released too early: the flakey software on today's production model makes for an unsatisfactory user experience. The fold-out design made its debut three years ago in Nokia's 6800. Finding an appropriate metaphor for this design isn't easy. We've suggested 'mousetrap', but Rafe Blandford's "gull-wing" is probably the most elegant and evocative. Based around a hinge, the keypad lifts up, and as the phone is rotated through 90°, with the screen rotating too, it reveals a split keyboard. This permits the phone designer to pack a full QWERTY keyboard into a small space, and it's an approach that doesn't compromise the simplicity of its use for basic phone functions. The widely copied Blackberry design offers fewer keys, and mixes up the numeric keypad with the other keys. A year later, Nokia followed the 2003 model with the 6820 [read our review], which knocked a third off the volume of its predecessor without significantly impacting the convenience of the QWERTY keyboard. For users who valued messaging, this was a welcome move, and the 6820 might be the most versatile phone ever made: 100mm and 100g remains the sweet-spot for phone designers today. The E70 sees a return to the larger proportions of the 6800, but packs in 802.11b/g Wi-Fi and a dazzling 352 x 416 pixel screen. This is twice the resolution of first and second generation Series 60 devices. Unfortunately, at this highly competitive end of the market, the decision sees the E70 weigh in as one the bulkiest, although not the heaviest, of its primary peers. See the comparison table below. Nokia will doubtless argue, with some justification, that only its 9300 and E70 models provide a full, QWERTY keyboard. And both too win out on features likely to appeal to enterprise: Wi-Fi and security. 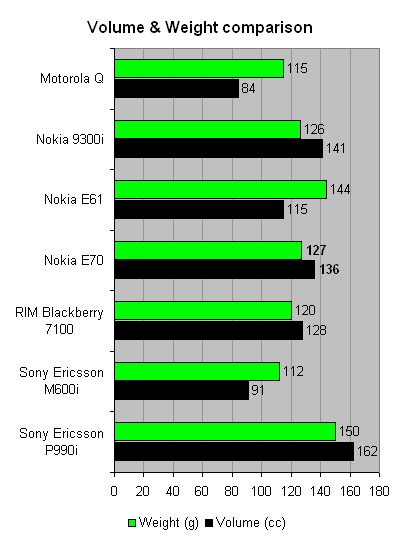 As you can see from the chart, Motorola's Q may steal the laurels by being the slimmest of the bunch but, incredibly, like the M600i, the Q doesn't offer Wi-Fi, and the Q screen feels cramped when compared to the luxurious Nokia displays.